Usually, I like to keep things simple in the kitchen. But, I also LOVE to experiment and try new, fun things. So it's a good thing that this recipe is both simple and fun! Coconut flour pancakes evaded me years ago when I first started exploring grain free cooking. I tried recipe after recipe and never liked any of them. They were either too eggy, too fragile, too light, too thick, too thin, or too bland. So, I gave it a rest. Until the other day when I noticed that I had one lime left on the counter and she was definitely on her last leg. I thought...my fridge is full of food, whatever shall I do with this poor lime? Oh, I know! 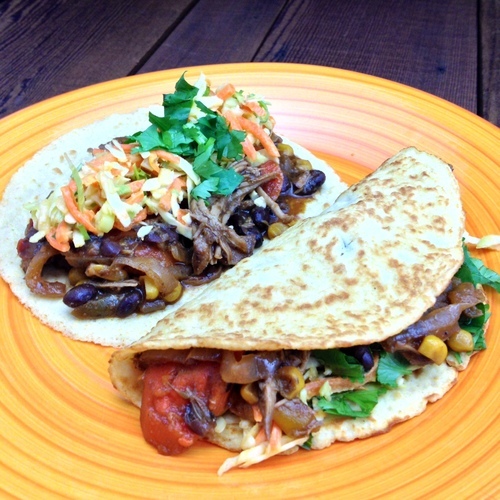 I'm use her zest and make some tortillas for my delicious pulled pork! GENIUS! I encourage you to make this recipe your own. Play with other spices and herbs, try a sweet version, use different ratios of flour and water to make thinner crepes or thicker cakes! The possibilities are endless! These bad boys are SO GOOD with my famous slow roasted pulled pork! *try other seasonings too like tumeric, garlic, and cayenne! Add just enough butter (about 1/2 tsp) to lightly coat the bottom of your skillet and place on the stovetop over medium heat. Add dry ingredients to your mixing bowl and whisk until combined and clump free. Add remaining ingredients and continue to whisk until well combined. When your skillet is hot, fill a 1/4 measuring cup about 3/4 full of batter and pour into the center of the pan. Is that too complicated? It's about 3 tablespoons of batter if you'd rather think of it that way but using the measuring cup as a ladle works well! Slightly tilt and rotate the skillet around until an even thickness and perfectly circular edge is formed. Cook until golden brown (about 3-4 minutes) and then slowly flip and cook another 3 minutes on the other side. If the tortilla is not browned, or still has little puddles of wet batter, or is super fragile, it is NOT ready to flip. Be patient if you want durable tortillas! Transfer your first tortilla to a plate and examine. If you think it's too thick, add a couple of teaspoons of water to the remaining batter. Repeat the tortilla making process adding more butter when desired. *Allow the tortillas to cool individually before stacking on top of each other. P.S. You can totally make these ahead of time (as in, on your prep days...you have one of those right??? good.) and store them in the fridge for later use.